Welcome to the School of Management's Achievement Index blog. Email your ideas and questions to us at kteleish@nyit.edu. 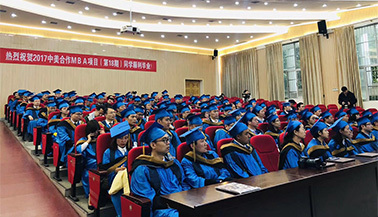 On April 15, NYIT partner Jiangxi University of Finance and Economics (JUFE) honored the first members of the Class of 2019 in a graduation ceremony in Nanchang, Jiangxi, China. 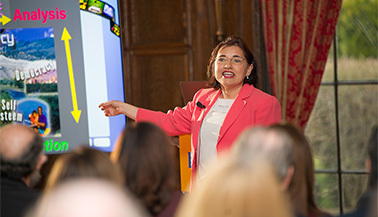 Nearly 190 scholars, scientists, professionals, and researchers were honored at the 18th Annual Faculty Scholars Reception at NYIT de Seversky Mansion on April 11. 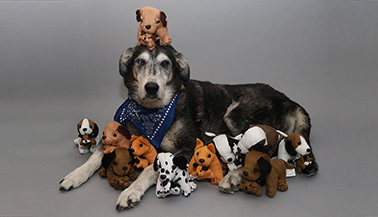 A new study by Assistant Professor Colleen P. Kirk, M.B.A., D.P.S., reveals that dog owners have greater psychological ownership of their pets—and a willingness to pay more for their care. Melanie Benyadi (B.F.A. ’17) loves the thrill of competition. 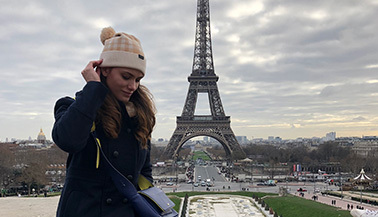 After receiving her bachelor’s degree in communication arts, the tennis player realized she loved problem-solving and is now winning competitions of a different kind as an M.B.A. student. 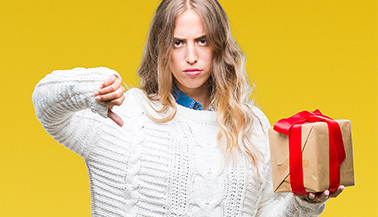 What Happens to Bad Gifts? 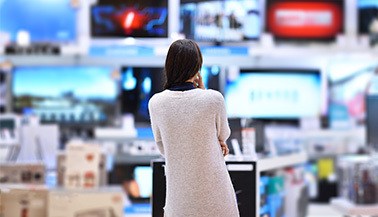 In an article in The Conversation, Associate Professor of Marketing Deborah Cohn, Ph.D., explains what people do with unwanted gifts. Students in Professor Gantasala's BUSI 435 class received Global Top 25 ranking from their GLO-BUS performance! BUSI 435 is a capstone course for business students that integrates knowledge and skills in various functional areas of business for corporate and business strategy development. 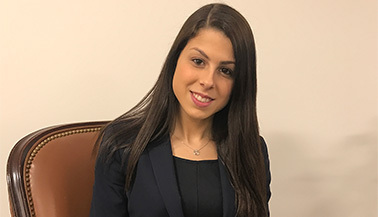 After interning with the InterContinental New York Barclay for just six months, Gabriella Veltri was offered a full-time position. Now, the NYIT alumna has a full-time job and pursuing an M.B.A. at NYIT. 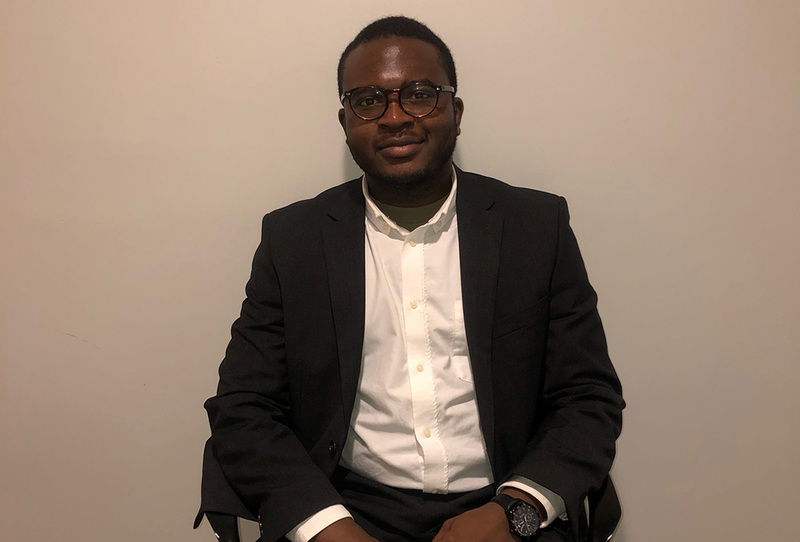 Sam Osho, a senior undergraduate student majoring in Finance, discusses the importance of building relationships in the School of Management and how it is an instrumental skill to learn for his future. Colleen Kirk, D.P.S., assistant professor of marketing in the School of Management, has reached a wide, non-specialist audience by writing an article describing her research for The Conversation US. 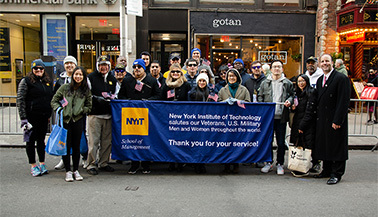 For the first time, more than 60 students, veterans, faculty, and staff marched as a dedicated group in the 2018 New York City Veterans Day Parade on November 11.